Here is an interesting tip. 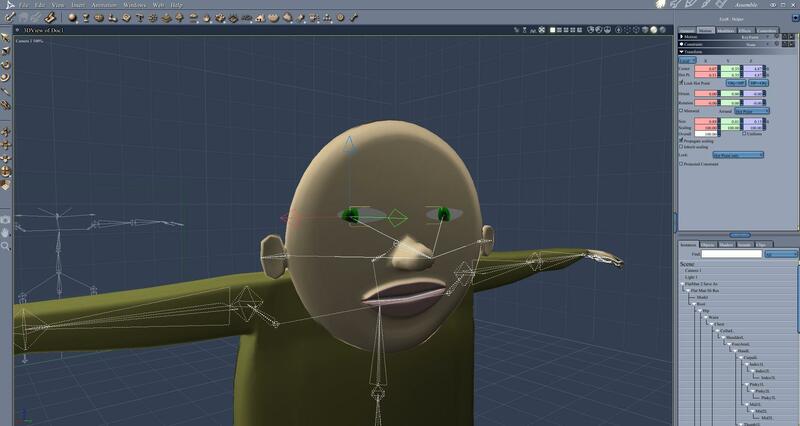 The eyes are rigged to bones. However, being flat, I don't want to rotate the eyes. Instead, I just want to slide the Iris/Pupil over the white area. If rigged in Studio and loaded in Carrara, you can unlock/unconstrain the polygons from the bone so they can be translated. Uncheck the box for protected/constraint. Oooh, this might work great for creepy painting with moving eyes! 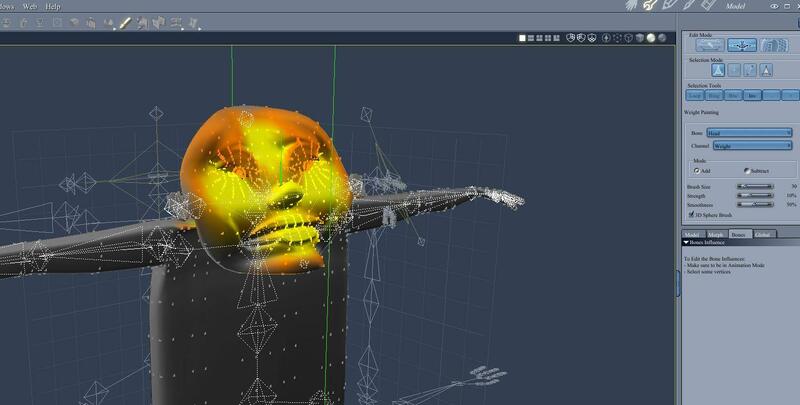 do you also do the weight painting in DS? if so is it easier than Carrara's weight painting? Usually, Carrara's skeleton and weightpainting is easier, which is why I do it. For Carrara, you do not have to create named polygon groups for each body part. 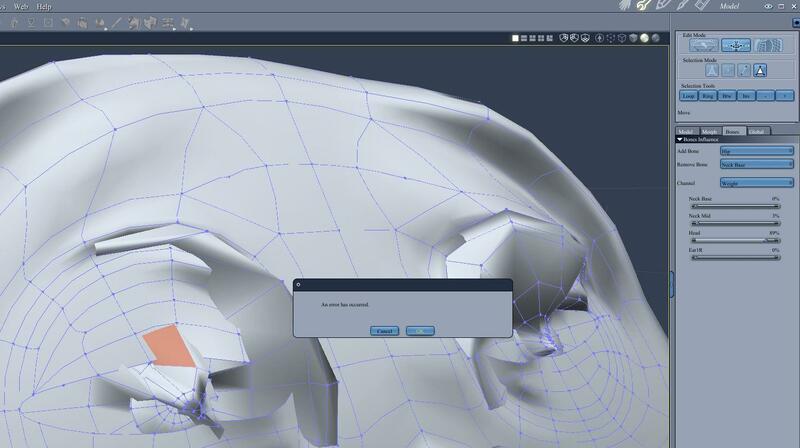 Carrara automatically assigns the polygons to nearby bones. That is usually good. Unfortunately, with this toon man, the head overlaps the chest. So, polygons in the head are influenced by the chest and collar bones. I've not only had to remove the influence of the chest, but I've had to add the head as an eligible bone. The weight brushes were acting funny, and at one pont deleted vertexes in the shoulder. 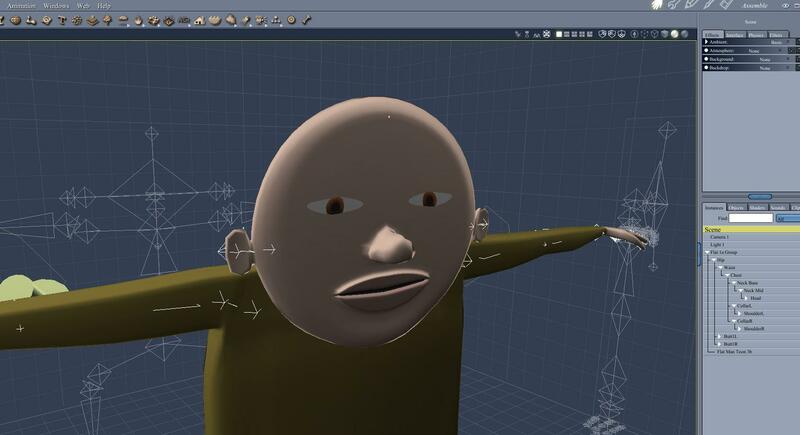 In this case, it was easier to assign the head polygons to a named group and create the skeleton in Studio. Shoulder disappear when try to remove influence of the head on the shoulder by uing the brush. But, if patient, can get decent results in Carrara (see cleaned side of head). 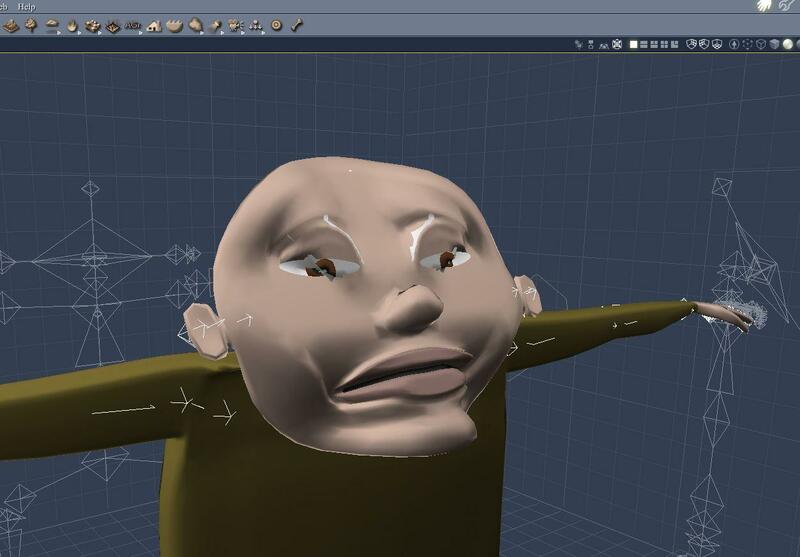 In order to prepare for rigging in Studio, the tedious part is assigning all the polygons to a named group. Don't have to do this if remaining in Carrara. Interesting. I learned the named group method (similar to Poser). Didn't realize it wasn't necessary. 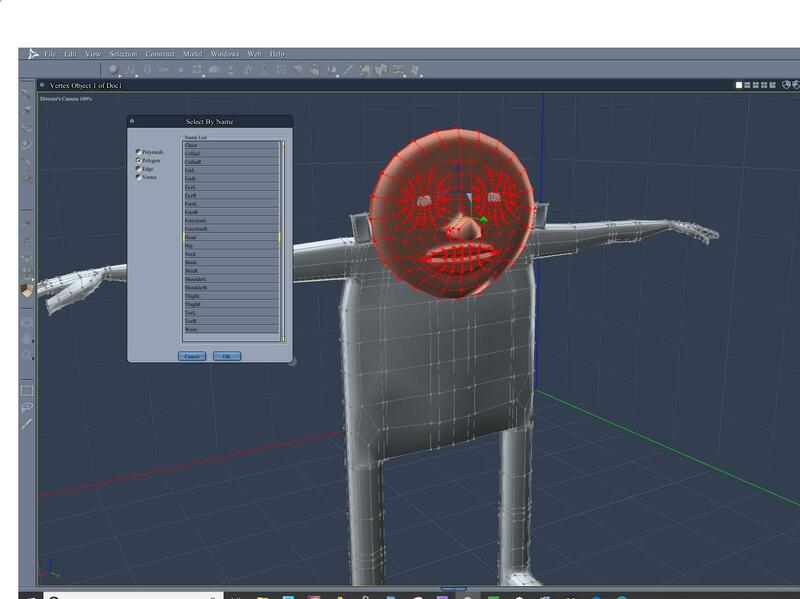 EDIT: One thing in Studio, if you have named groups, the "align" menu within the setup and joint editor process helps a lot wih the orientation. When it comes to hard surfaces (buildings, machines etc), I find it much easier to rig in DS: weight painting is just one click (Fill by bone selection groups), whereas the weight painting in Carrara becomes frustratingly fiddly. Also, if you have your doors, levers etc as separate vertex objects (which you'd do anyway if you wanted to set up simple rotations insead of rigging), they'll automatically get assigned names as part of the export, so you don't have to set up name groups. The downside is that reimporting the .duf generally leaves you with a single mesh, and that might take some effort to split up should you need to (I normally don't at that point). Having a dry spell. Need inspiration. lots of unfinished projects that I’m bored with. upset that substance painter acquired by adobe. Just bought it last summer. Wouldn’t have done it had I known. Ouch, that must feel like a betrayal. I still use my CS5 software, but once they went all rental I knew I would never be doing business with them ever again. the christmas, new year period gets me away from creating stuff and helps recharge... maybe time for a break. 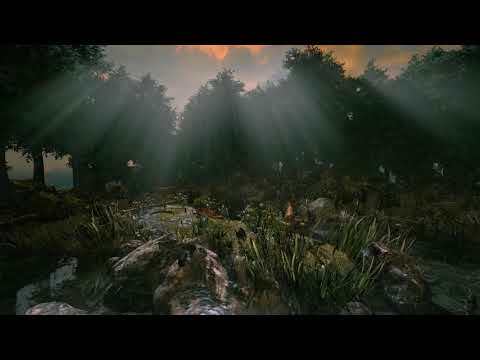 Flowscape looks pretty cool. I should check it out. wow that does look cool, I see it does not export mesh but assume does renders I hope maybe 360 renders? Think I need to do some personal RRRR to break out of my rut. RRRR is the random runtime render challenge. Use a randowm number generator to pick some stuff and render it. random runtime Carrara challenge ? Using DIM for general content related help. The Daz Install Manager (DIM) has quite a few functions that can help with everyday organization. For products that are installed, you ca use it to find the stuff. This is very useful for tracking down texture fles that don't load and similar. In addition, it can be used to sort and identify content associated with speciifc programs. In the installed tab, right click on the top "product" line and a menu appears. You can seelct by tagged program, which means you can select by products tagged for Carrara. So, select by tagged carrara, then you can export tht list as a csv / txt file. EDIT: had to correct a totally wrong staement about hiding suff. Here is an example. I selected all installed items that are tagged for a version of carrara (there are several). I exported those selections as a csv file. I opened the file in a spreadsheet. Here are the first 50 or so products. 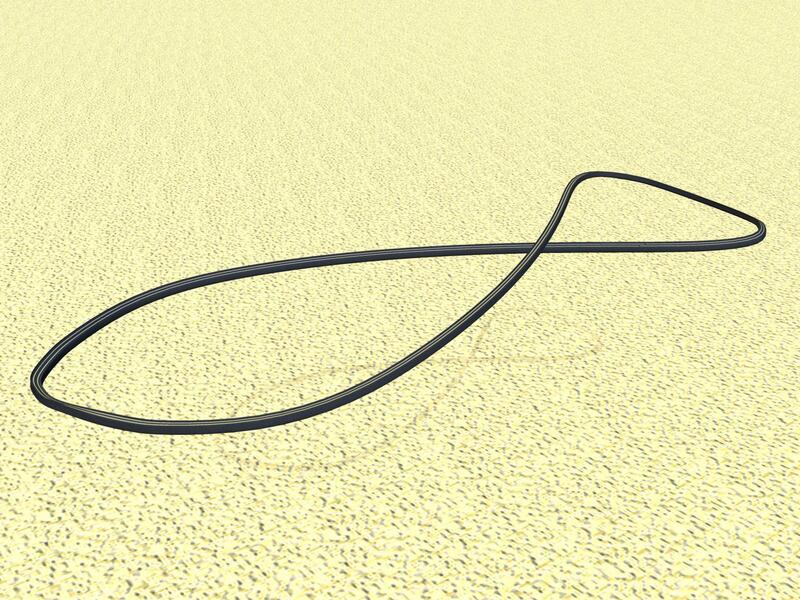 I used the vertex modeler's polyline tools and the sweep function to create a figure 8. 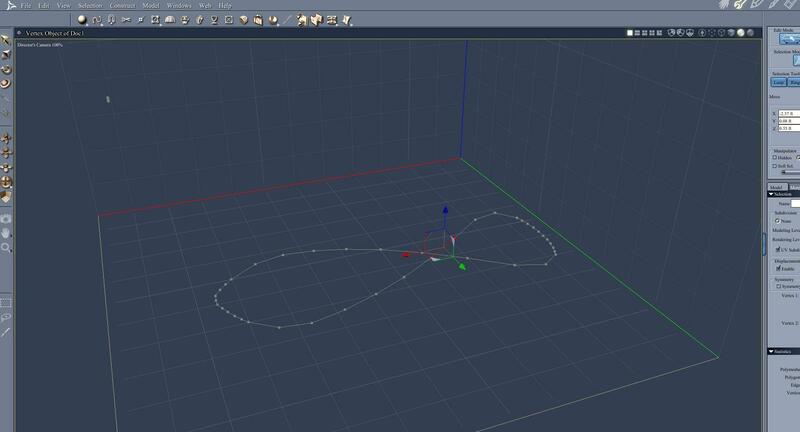 - in vertex modeler, change camera to a direction camera and used polyline tool to draw points for a squared U. Used snap-to-grid to keep sections even. Lots of points s can make lanes later. 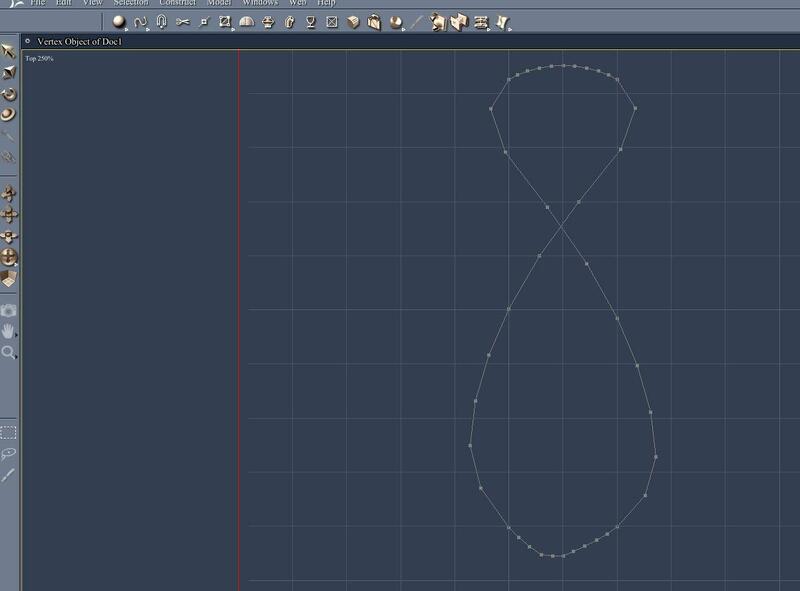 - changed camera to top and chose a curve tool to draw a figure 8. - changed camera to directors camera, selected a line where the 8 crosses and moved in Y-axis direction slightly. - selected the original U shape. Went to model menu and found the SWEEP function under the CONSTRUCT tab. - with the original U still selected, choose SWEEP, then in the right handproperties tray choose the type of seep you want (irregular, regular, etc), and click on curved 8 polyline path. - note, may get a funky result where the original U is. If so, select those edges and use the rotate tool to fix. - note, remember to delete the figure 8 polyline sweep path. - number of options to create sense of depth for the track model. Could seelct the whole track, duplicate, then select te edges and use the bridge ool to connect. 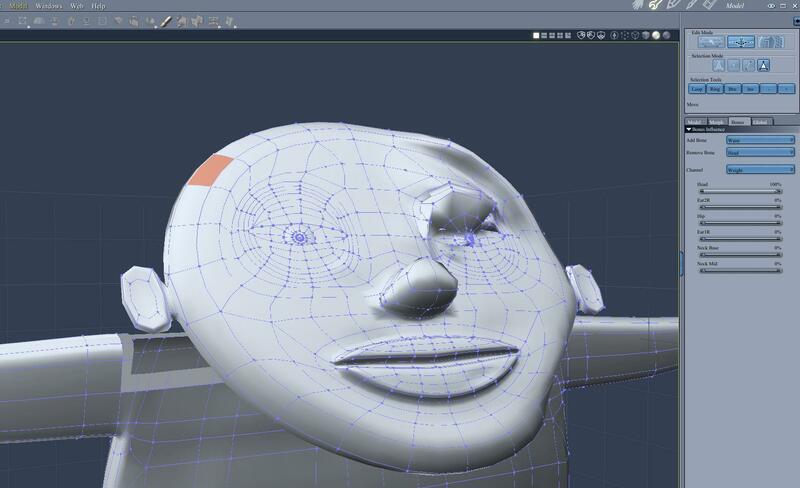 - I chose to just select the track and used "add thickness" under the MODEL tab. I chose a very small distance for the add thickness. - checking the box for smoothing and I have my basic figure 8 track. UVMapping firs create shading domains. - first I assigned shading domains because they can help with uvmapping. - The add thickness step results in a selection of the added polygons. 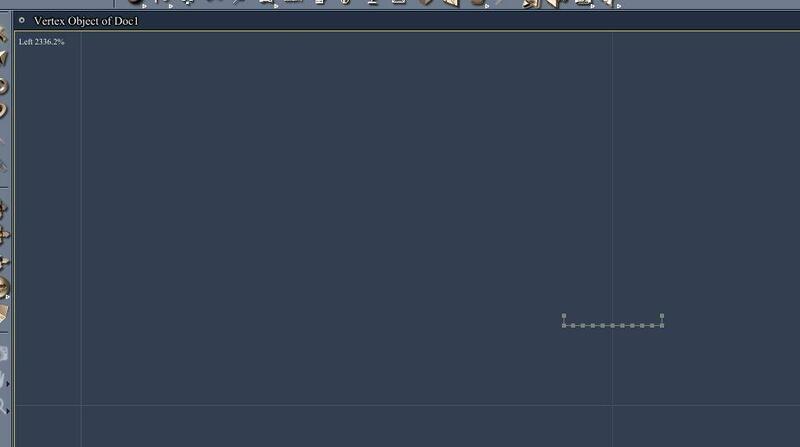 I used the minus (-) key in the modeler to deselect one row and then created a shading domain for the bottom of the track. - I then used the plus (+) key in the modele select menu and "deselect by shading domain" to isolate the polygons I wanted for the outside sides of the track, and the inside sides of the track. I created shading domains for each. - The flat trak surface should be the unassigned polygons (texture 0). 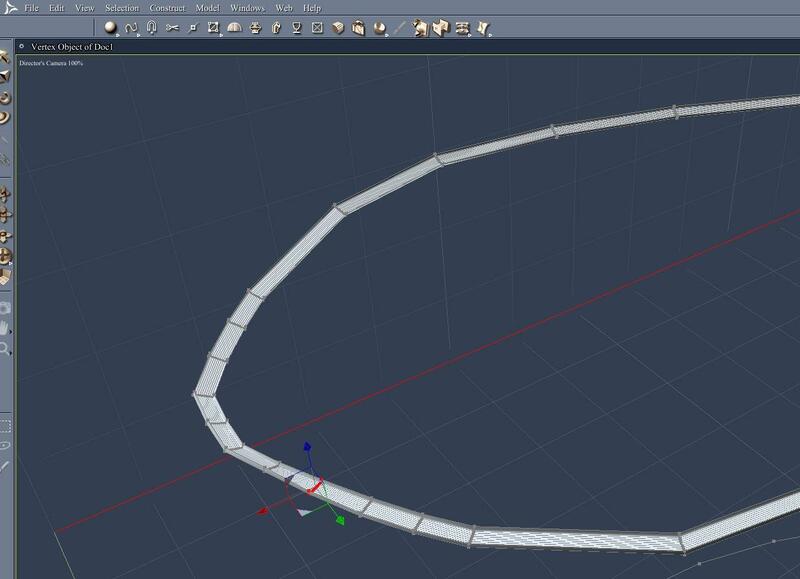 I selected two adjacent polygons and loop to get the lane separators in that top track surface. - The texture 0 unasigned polygons are now the track surface (not the lane marker polygons). - And here is a test render applying some simple shaders without trying to improve uvmapping. UVMapping the Figure 8 - I tried Two Ways, but each started from the same seams. Way #2 - want to make sure that uvmap does not have any overlaps. Especially important if painting the model or if the regions where the tracks cross need to be different. To prepare for both, I used the seams function under the uvmapping "unfold" tab to separate the shading domains. - I selected an edge of the side of the figure 8 at the top of the outside and hit loop. (Can use the selection tool to confirm you have the edge of the shading domain. - Click the plus (+) under the unfold tab and the selected loop turns blue. It is very easy to confuse the plus (+) under the unfold tab with the plus (+) under the seelction tab so watch for that. - Repeat for other edges that want to separate. I made it so could separate bottom, outsides, insides, and top track surface. The top track surface has two shading domains because of the lane markers. 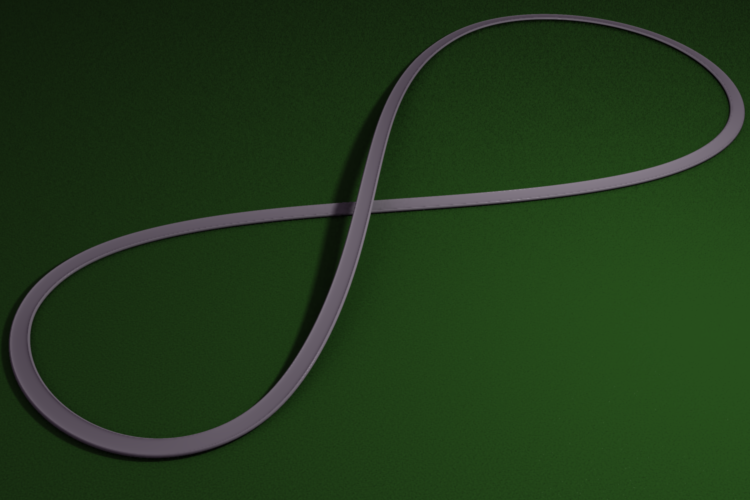 - I selected and created perpendicular seams looping to cut the shading domains at the corners of the 8. You could do more or fewer cuts, depending on whether you plan to spend the time to straighten all of the loops. I won't be straightening all of the loops, bt the for corner cts allow me to very roughly rotate the strips so they generally are vertical. - I then hit "unfold" an the uvmap strips or "islands" are spread across the bottom of the uvmap square and look very tiny. - If you double click on a point on any island at bttom of uvmap square it will select just that island. Very Handy!!!! - Also you can still select by shading domains. Also very handy. - I selected by the Outside shading domain o get all of those islands. I used the translate tool to move tem all up and then scaled and moved them outof the way. - I repeated for the inside edge islands. - I selected the Bottom shading domain. Because I matched the seam edges to the shading domain edges, all is well. - I left the "unfold" tab and went to the OPERATIONS tab of the uvmapping area. Under operations, I detached polygons (not sure that is necessary). - With bottom still selected, I then applied a planar preset with te Y axis and "no split". - The result looks like an "8" and then Iscaled and moved the 8. - Repeat for the top surface of the track, which contains two shading domains (in my case, the track surface texture 0 and lane markers). Applying planar preset yields another 8. - These two 8s have uvs that cross. 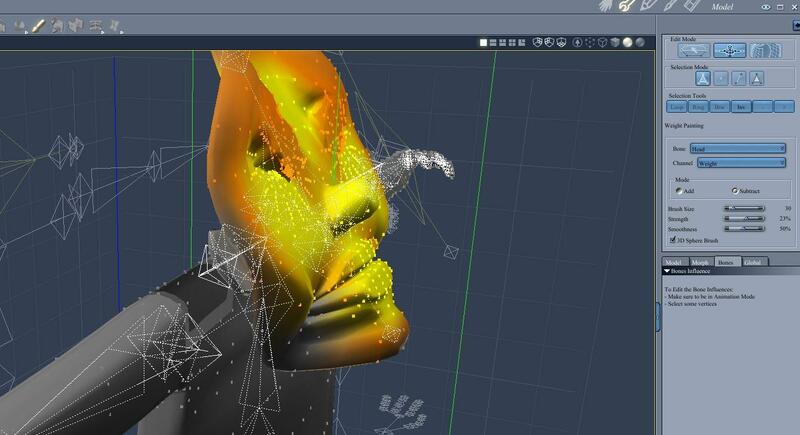 If that doesnt matter, then just scale and fit your UVs to the UVMap. Adjust UVMap Way #2, fix so UVs for te 8 don't cross. - This starts from the same sams and the same unfold. - The UV islands are at the bottom of the square just like above. - Here, I double click on each island and scale it individually. - There are essentially two kinds of strips. Longer strips run the length of the 8 and contain the crosses. - Shorter strips run at the top and the bottom. - I selected each strip individually and rotated / scaled it roughly vertical on the map. - The longer strips are roughly the same length. - The shorter end strips ae roughly the same length. Suggestions to improve this model and improve this uvmap welcome. I plan to use the track as part of this month's Retro challenge. Try to picture some "matchbox" or similar retro toy cars (the ones that had the needles that fit in the groove of the track) racing along the track. 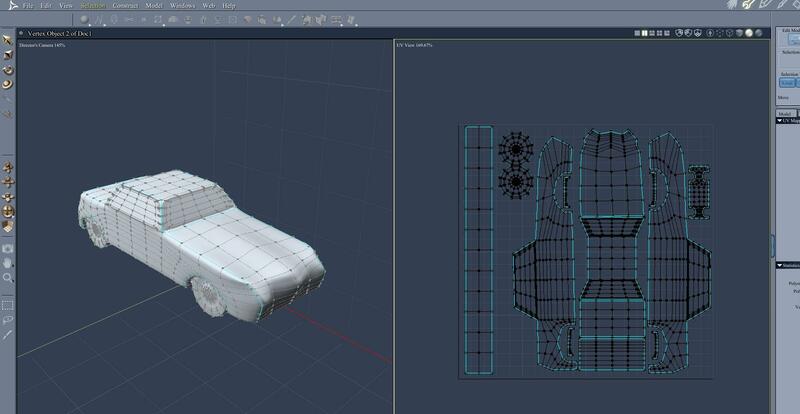 And here is a simple toy car model and uvmap with enough (hopefully) mesh density for morphs to create the other cars.